We recently had an uptick in queries about our pipeline hotline number monitoring services. And while we have been helping these types of customers for years, I am new to the industry, and decided to dig into why this is such an important part of operations for companies in the pipeline industry. And, as a marketer, I was also curious as to why interest had peaked for this particular service. 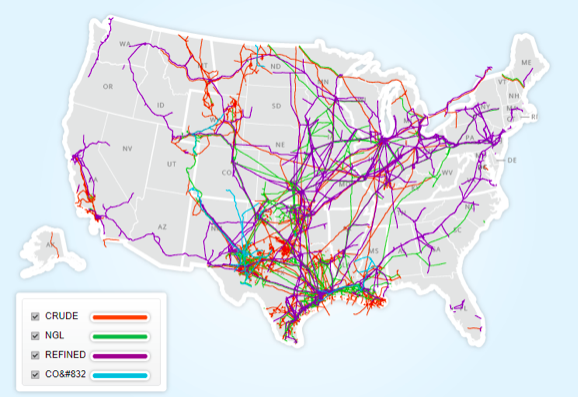 There is roughly 2.4 million miles of pipeline stretching across the United States. They transfer all sorts of liquids and gasses through a system of pipes allowing us to do things like heat our homes and cook with gas, have access to running water at the turn of a faucet, and sanitarily flushing away our sewage. These pipelines can be found almost everywhere. Much of our pipeline system is buried underground, but there are some above ground pipelines running thousands of miles across some of the country’s less densely populated areas. Our longest above ground pipeline is the Rockies Express Pipeline which stretches from Meeker, Colorado to Clarington, Ohio. As with any industry that has the potential to cause harm to people or the environment due to operations, pipelines are regulated by the U.S. government. The Department of Transportation(DOT), and more specifically the Pipeline and Hazardous Materials Safety Administration(PHMSA) which is a division of the DOT are tasked with overseeing pipeline safety. Why the Uptick in Queries? One theory of explanation is the potential enforcement of stricter integrity management processes requirements. In July of 2018, there was an Advanced Notice of Proposed Rulemaking (ANPRM) issued asking for comments regarding safety measures for pipelines in response to population growth or “population class”. An ANPRM, is used by an agency to acquire public input on proposed changes to rules or regulations. What Does This Mean for Pipeline Companies? According to an article in The National Law Review, this proposed expansion of integrity management requirements would affect the actions that an operator of a gas transmission pipeline is required to take when population growth near a pipeline causes its “class location” to change. Why This Matters To Pipeline Operators? Without getting into the technical nitty gritty of the details, “class locations” range from class 1 to 4. “Class 1” refers to less densely populated/rural areas and “class 4”, are the most densely populated areas. When a pipeline is designed, constructed, and operated, things like construction materials and maximum allowable operating pressure are taken into consideration. This differs based on “population class”. This proposed regulation expansion is aimed at making sure that when a pipeline location class changes, that the pipeline operator follows stricter guidelines. This could mean things like running different types of pipes, decreasing operating pressure, or developing stricter public safety protocols. Why Is Hotline or Emergency Number Monitoring Such Serious Business? There have been roughly 3200 occurrences of “significant incident” natural gas pipeline events alone since 1987 reported by PHMSA/DOT. On January 8, a 12-inch pipeline was damaged and leaked 500 barrels (27,500 gallons) of gasoline in Eagan, MN. No injuries were reported however gasoline flowed into the storm water system. According to Magellan Midstream Partners, the owner of the pipeline, a contractor the company hired accidentally struck and broke open the pipeline that runs from Rosemount to Minneapolis. On January 10, a pipeline in Pearl City, Hawaii ruptured and leaked an estimated 500 gallons of fuel oil into two residents' yards. The state Department of Health says a small amount of oil entered the stream. On January 14, a natural gas pipeline ruptured, leading to a fire in Geismar, Louisiana. No injuries or fatalities were reported. On January 30, a crew using a boring drill hit a natural gas pipe, in Arlington, Texas. Escaping gas ignited and burned for over 3 hours. There were no injuries. On January 31, a gas pipeline exploded and burned in Noble County, Ohio. There were no injuries. On February 18, a 16-inch crude oil pipeline ruptured in Yukon, Oklahoma. Oil accumulated in a 7-acre private pond. About 84,000 gallons of crude were spilled. On February 23, a house in a suburb of Dallas, Texas exploded, killing a girl, and injuring 4 others in her family. This followed a number of gas distribution line leaks in that area over the previous months. Atmos crew then started large scale replacement of gas lines in that area, resulting in at least 2,800 homes being without gas service for days to weeks. NTSB Investigators were sent to the area. On March 3, a fallen electric wire from a utility pole caused a gas line to rupture and burn, in Wenham, Massachusetts. There were no injuries reported. On March 21, a [Marathon] pipeline spilled about 42,000 gallons of diesel fuel, near Solitude, Indiana. On May 10, a crude oil pipeline ruptured in Oklahoma City, Oklahoma, leaving a film of crude on a school playground, homes and automobiles. At least 630 gallons of crude were released. On May 14, a tractor crashed into a valve on an NGL pipeline in St. Mary Parish, Louisiana, releasing a cloud of a blend of propane, butane, ethane and natural gasoline. Residents and two schools were evacuated for several hours. There was no fire or explosion. On May 23, a pipeline rupture and fire in Bienville Parish, Louisiana forced at least 30 nearby residents to evacuate. There were no injuries. On June 7, a 36-inch natural gas transmission pipeline exploded and burned, near Wheeling, West Virginia. There were no injuries. The pipeline went into service in January 2018. Shifting land was identified as the cause. On June 14, a gas pipeline in Tulsa, Oklahoma was ruptured by a tractor. A Firefighter and four Oklahoma Natural Gas workers were injured in the explosion and fire that followed the rupture. An initial report said one of the injured was a bystander. On June 19, a Sunoco pipeline leaked more than 33,000 gallons of gasoline into a creek, near Philadelphia, Pennsylvania. PHMSA said it first learned of the spill on the evening of June 19 from a “private citizen” who reported a petroleum odor at Darby Creek. About two-thirds of the spill was recovered. On August 1, a series of gas pipeline explosions injured seven pipeline workers and firefighters in Midland County, Texas. One injured worker later died. They were responding to a leak report. On September 6, a 6 inch Dominion Energy gas gathering pipeline burned, near Clarksburg, West Virginia. Lightning was suspected of hitting the pipeline. On September 7, a Buckeye Partners pipeline ruptured in Decatur, Indiana, spilling about 8,000 gallons of jet fuel into the St. Mary’s River (Indiana and Ohio). On September 10, a 24 inch Energy Transfer Partners gas transmission pipeline exploded and burned, in Center Township, Beaver County, Pennsylvania. One home, 2 garages, and 6 steel high tension power line towers were destroyed, but no injuries were reported. The pipeline had been operating for 1 week before the failure. Earth movement was suspected as the cause. As you can see damage is prevalent, and safety is a high concern. Rule of thumb, if you see something odd—say something. It could save lives and reduce negative effects on the environment. How Do You Report Potential Emergencies? Pipeline companies are required to have signage attached to their pipeline which tells you about the product running in the pipe, the pipeline operator who is responsible for maintaining the pipeline, and a 1-800 number listed for you to call to report potential problems. This number should be answered 24/7/365. 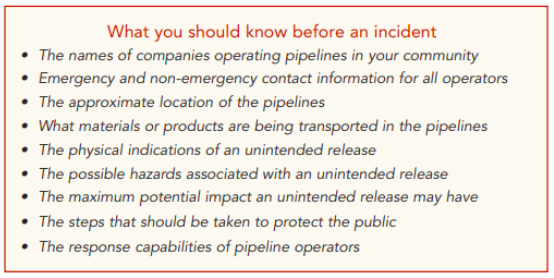 If you don’t see a marker or number to call, and aren’t aware of who provides local services for those types of pipelines, then it is recommended that you call 911 to report the incident. Operating contentiously is an expectation of the modern-day business. And, when it comes to safety and the environment, pipeline companies, especially those carrying hazardous materials will continue to be heavily monitored by the government, to try and ensure that operators are choosing safety over cost. As community members we need to play our part too. It is our duty to alert someone when things don’t seem right. And, with the miles and miles of pipeline out there, it is pretty safe to assume that maintenance items slip through the cracks, unnoticed, every now and again. Diligence on all sides is key to making sure that our modern-day infrastructure is a success.